I love Thai food. I love the spiciness, I love the flavors, and I especially love anything that comes with peanut sauce. For this reason, one of my favorite things to order at a Thai restaurant is chicken satay. 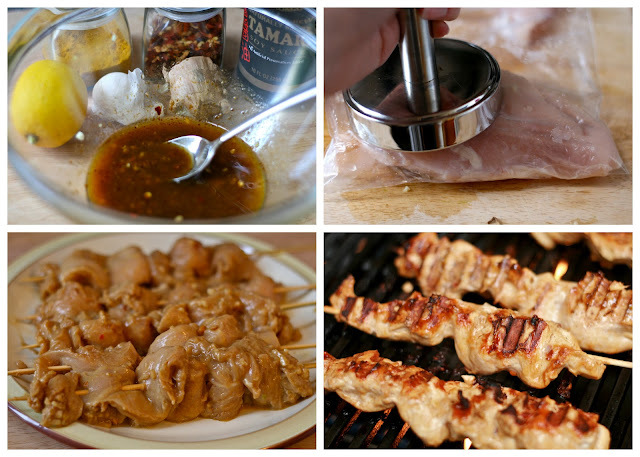 It's marinated chicken served on skewers with a spicy peanut sauce. Recently it occurred to me...this would be perfect for a tailgate! All you have to do is marinate your chicken the night before, and then in the morning thread the chicken on the skewers and transport it to the tailgate. To make the peanut sauce, I sort of just combined the flavors I like after reading several recipes for inspiration. I can't vouch for authenticity, but I can tell you it's delicious. All you have to do is combine ingredients in a food processor until smooth and you're good to go. (The chopper attachment of my immersion blender worked great for this). For the chicken, combine marinade ingredients in a small bowl and whisk together. Trim all visible fat and tendons from chicken breasts, pound until even, and cut each breast into strips. Put chicken pieces and in ziploc bag, pour in marinade, then seal bag and turn over several times so chicken is well-coated with marinade. Let marinate in refrigerator, a minimum of a few hours, or all day. To cook chicken, first spray grill with olive oil, or wipe with paper towel dipped in oil. Preheat charcoal or gas grill to medium high. Thread two chicken pieces onto each skewer, folding back and forth as you go. Grill chicken about 10 minutes, turning once, until it's nicely browned and feels firm (but not hard) to the touch. Serve chicken with peanut sauce. Soak skewers in warm water for 30 minutes. Trim all visible fat and tendons from chicken breasts, pound until even, and cut each breast into strips. Combine marinade ingredients in a small bowl and whisk together. Put chicken pieces and in ziploc bag, pour in marinade, then seal bag and turn over several times so chicken is well-coated with marinade. Let marinate in refrigerator, a minimum of a few hours, or all day. To cook chicken, first spray grill with olive oil, or wipe with paper towel dipped in oil if you don't have an olive oil mister. Preheat charcoal or gas grill to medium high. Thread two chicken pieces onto each skewer, folding back and forth as many times as you can to get a lot of the chicken surface exposed to the grill. Grill chicken about 10 minutes, turning once, until it's nicely browned and feels firm (but not hard) to the touch. Combine peanut sauce ingredients in a food processor and mix together. Serve chicken hot, with some sauce on the side for dipping chicken pieces. Garnish with additional cilantro leaves if desired.